Here is a quick update on the political situation in France. 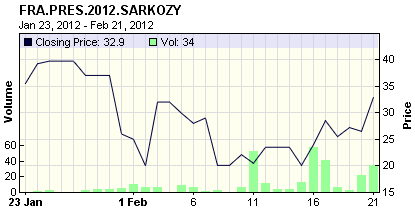 Since Sarkozy announced that he is running for president again, he has picked up some steam in the polls. But his chances of winning are still under 33% on Intrade. 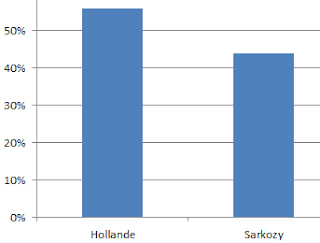 The latest polls show Hollande (the Socialist candidate) comfortably in the lead. Le Pen is stuck at 17% - she would actually try to push France out of the Eurozone altogether. That lead is also there for the polls in the head-to-head run-off election between Hollande and Sarkozy. 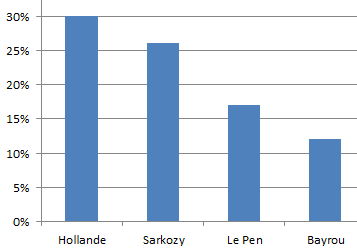 As discussed before, Hollande's lead is a reflection of France's uneasy economic situation. 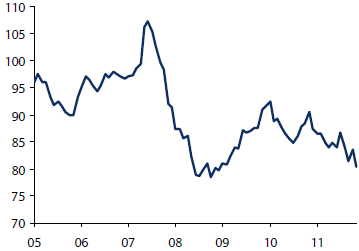 Household confidence has sunk to the levels not seen since the early 2009. 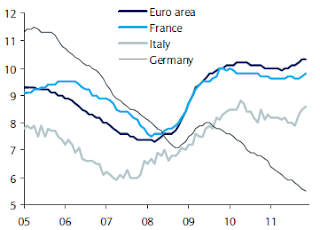 The unemployment is holding stubbornly above 10% - still materially above Italy - and is expected to rise further (while Germany's is falling). The trade deficit remains a problem and the banking sector is struggling (more on that later). All of these factors are pointing to Hollande's victory in the upcoming April-22d and May-6th (2-round) presidential elections. A change of the guard in France, particularly to a Socialist government may potentially shift the balance of power and the regulatory framework in the Eurozone. It is possible that Germany may find itself less able to drive the euro area policy after this election.